Trim the bittergourd & cut in to half. Heat 1 tsp oil in kadai, add onion,tomato,ginger,garlic Cashew &saute few mins. Make in cool & grind to a fine paste. Add oil in a pan, add this paste ,gram flour,turmeic powder, chilli powder,jaggery & salt. Saute few mins & stuff the bittergourd. Add oil in a pan, add mustard seed,cuminseed & stuffed bittergourd. Cook until all its done & serve with rice or breads. 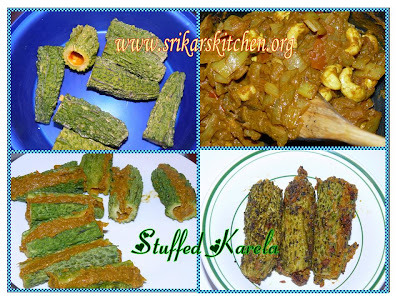 Wow nice entry.I love karela curry.But i never cook stuffed karela.This i will try. i fall in the category of people who happen to like Karela! never made them stuffed though..good recipe! Lovely one Sri..I like the karelas stuffed with gramflour..yummy post..
Sri this is so perfect and I doubt I could ever make something this good with bittergourd!!! 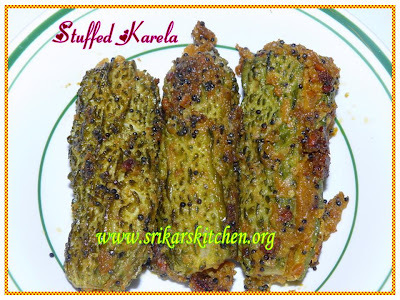 Never tried stuffed karela. Nice recipe and looks yummy. WOw looks delish. Not tried this, will try. Hubby is a big fan of this vegetable,nice filling...will give a try next time..
Long back I ve seen in Bitter event, Delicious way to eat! I dont like this veg, but this recipe looks gud :) !!! Interresting recipes on this blog; greeting from Belgium.